There's more to this world than just people, you know. Van Gogh would've sold more than one painting if he'd put tigers in them. I don't know which is worse...that everyone has his price, or that the price is always so low. Tigers add panache and savoir faire to any social occasion. [on phone] What do you mean Calvin left his clothes with Susie?? Either he's playing classical music at 78 RPM, or I'm still dreaming. I'm going to the office and get some sleep. The world didn't turn color until sometime in the 1930s, and it was pretty grainy color for a while, too. I have all these great genes, But they're recessive. That's the problem here. It's going to be a grim day when the world is run by a generation that doesn't mean anything but what it's seen on TV. Susie: Uh oh... here comes Calvin - the Incurable Weirdness poster child. Calvin: This piece of pie is awfully darn small! Calvin's Mom: Life could be a lot worse, Calvin. Calvin: Life could be a lot better too! … But worse is more likely. Calvin's Dad: Most people just go to Sears, buy the assembly kit, and read the instructions. Calvin's Mom: Dear, what are you telling him now?! Calvin: Do you think babies are born sinful, that they come into the world as sinners? Hobbes: No, I think they're just quick studies. Calvin: Whenever you discuss certain things with animals, you get insulted. Calvin : You can't just turn on creativity like a faucet. You have to be in the right mood. Hobbes : What mood is that? Calvin: I want the last piece of pie! Don't divide it up! Give it to me! Calvin's Mom: Don't be selfish, Calvin! Calvin: So the REAL lesson here is "Be Dishonest?" Calvin: I'm a genius, but I'm a misunderstood genius. Hobbes: What's misunderstood about you? Calvin: Nobody thinks I'm a genius. Calvin: Our top-secret club, G.R.O.S.S.-- Get Rid Of Slimy girlS! Calvin: I know that's redundant, but otherwise it doesn't spell anything. Hobbes : "What are you doing?" Hobbes : "You look more like you're bored." Calvin : "The world bores you when you're cool." Hobbes : "What do you think is the secret to happiness? Is it money, power or fame?" Calvin : "I'd choose money. If you have enough money, you can buy fame and power. That way you'll have it all and be really happy. Happiness is being famous for your financial ability to indulge in every kind of excess." Hobbes : "I suppose thats *one* way to define it." Calvin : "The part I think I'd like best is crushing people who get in my way." Hobbes : "Do you think there's a God? Calvin : "Well somebody's out to get me!" Hobbes : "It says here that by the age of 6, most children have seen a million muders on television." Calvin : "I find that very disturbing...it means I've been watching all the wrong channels." Calvin : "Do you really think Bogeymen exist?" Hobbes : "I'm not sure, but if they do, I think this is where they live…"
Calvin's Dad: "The world isn't fair, Calvin." Calvin: “I know Dad, but why isn't it ever unfair in my favour?" Calvin: "There's a new girl in our class." Hobbes: “Well, whats her name?" Calvin: “WHO CARES? Not me!" Hobbes: “Do you LIKE her?" Calvin's Dad: Honey, have you seen my glasses? Calvin's Mom: No, I haven't. Calvin: Calvin, do something you hate! Being miserable builds character! Calvin's Dad: Okay, I admit the voice was a little funny, but that's still one darn sarcastic kid we're raising. Calvin's dad: Being a parent is wanting to hug and strangle your kid at the same time. Hobbes: "This article says that many people find christmas the most stressful time of year." Calvin: “I believe it. This season sure fills *me* with stress." Calvin: “ I *hate* being good..."
Calvin: "Any monsters under my bed tonight?" Calvin: “Well there *better* not be, I'd hate to have to torch one with my flamethrower!" Hobbes: “You have a flamethrower?" Calvin: "Dad, I'd like to have a little talk." Calvin: “As the wage earner here, its your responsibility to show some consumer confidence and start buying things that will get the economy going and create profits and employment. Here's a list of some big-ticket items I'd like for Christmas. I hope I can trust you to do whats right for our country." Calvin's Dad: “I've got to stop leaving the Wall Street Journal around." Calvin (writing, after being asked to explain Newton's First Law of Motion "in his own words"): Yakka foob mog. Grug pubbawup zink wattoomgazork. Chumble spuzz. (speaking) I love loopholes. Calvin: "Do you like being a girl?" Susie: “Its gotta be better than the alternative." Calvin: “Whats it like? Is it like being a bug?" Calvin: “I imagine bugs and girls have a dim perception that nature played a crual trick on them, but they lack the intelligence to really comprehend the magnitude of it." Calvin: "Hello Susie, this is Calvin. I lost our homework assignment. Can you tell me what we were supposed to read for tomorrow?" Susie: “Are you sure you're not calling for some other reason?" Calvin: “Why else would I call you?" Susie: "Maybe you missed the melodious sound of my voice?" Calvin: “WHAT? Are you crazy? All I want is the STUPID assignment!" Susie: “First say you missed the melodious sound of my voice." Calvin: "Here comes that new girl. HEY SUSIE DERKINS, IS THAT YOUR FACE OR IS A POSSUM STUCK IN YOUR COLLAR? I HOPE YOU SUFFER A DEBILITATING BRAIN ANEURISM, YOU FREAK!" Hobbes: “She *cute*, isnt she?" "GO AWAY!" Susie: You're not great! You're the most conceited blowhard I've ever met! Calvin: When you're great, people often mistake candor for bragging. Calvin: "Here's a movie we should watch." Calvin: “It says 'Japanese Cast'...two big rubbery monsters slug it out over major metropolitan centres in a battle for world supremacy...doesn't that sound great?" Hobbes: “And people say that foreign film is inaccessible." Calvin: "I wonder where we go when we die?" Calvin: “You mean if we're good or if we're bad?" Calvin: "I'm never gonna get married. Are you?" Hobbes: “Hmm...I suppose if the right person came along, I might. Someone with green eyes and a nice laugh, who I could call 'Pooty Pie'." Hobbes: “Bitsy pookums I'd say. Yes snoogy woogy, she'd reply..."
Calvin: "I think that would affect my stomach a lot more than my heart." Calvin: "MOM, CAN I SET FIRE TO MY BED MATTRESS?" Calvin: “CAN I RIDE MY TRICYCLE ON THE ROOF?" Calvin: “Then can I have a cookie?" Calvin: “She's on to me." Calvin: "Mom's not feeling well. So I'm making her a get well card." Hobbes: “That's thoughtful of you." Calvin: “See, on the front it says, 'Get Well Soon' ... and on the inside it says,'Because me bed isn't made, my clothes need to be put away and I'm hungry. Love Calvin.' Want to sign it?" Hobbes: “Sure, I'm hungry too"
Calvin: Do you have any money? Calvin: How can we get some? Who do you know that we could sue? Hobbes: “We *dont* like girls???" Calvin: "Of course not dummy, we're a murderous bunch of pirates, remember?" Hobbes: “Who do we smooch then?" Calvin: "This meeting of the Get Rid Of Slimy Girls club will now come to order. First Tiger Hobbes will read the minutes of our last meeting." 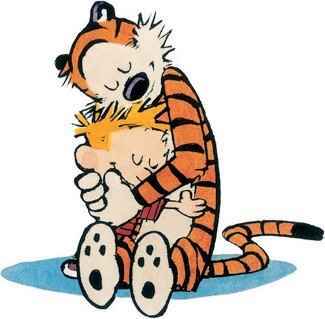 Hobbes: "Thank you. (9:30) Meeting called to order. Dictator For Life Calvin proposed resolulion condemning the existence of girls. (9:35) First Tiger Hobbes abstains from vote. Motion fails. (9:36) Patriotism of First Tiger called into question. (9:37) Philosophical discussion. (10:15) Bandages administered. Dictator For Life rebuked for biting." Calvin: “(10:16) Forgot what debate was about. Medals of bravery awarded to all parties." Calvin: "Too bad the world will be ending soon." Calvin: “Halley's Comet. Comets are harbingers of doom." Hobbes: “No they arent, thats just superstition." Calvin: “Really? Guess I'd better write that book report." Miss Wormwood: "What state do you live in?" Calvin: Hi Mom! I’m making my own newspaper to report the events of our household. Calvin: Now I’m looking for a page one lead story. Can I interview you? Calvin: OK, what are you cutting up there for dinner? Calvin: KNIFE WELDING MOTHER HACKS ICHTHYOID! GRIM MELEE IS EVENING RITUAL! SUBURBAN FAMILY DEVOURS VICTIM! Calvin's Mom: Out of the kitchen! Out! Out! Calvin: I mean, look at this! We still have weather?! Give me a break! Calvin: Oh no! I just remembered that today is “Show and Tell” day! I need something to show and tell about. Mum: Why can’t you think of these things more than two minutes before the bus comes? Calvin: Never mind, Mom! Do we have any plastic bags? Susie: Why didn’t you sign up to play baseball like the rest of the boys? Don’t you like sports? Calvin: I hate all the rules and organization and teams and ranks in sports. Somebody’s always yelling at you, telling you where to be, what to do, and when to do it. I figure when I want that, I’ll join the army and at least get paid. Calvin: I don’t understand it, Hobbes. The kids teased me when I wouldn’t play baseball. Then they yelled at me when I did play. Then the teacher called me a “quitter” when I stopped playing. Unless you’re a star you can’t please anyone. Hobbes: In that case, why not just please yourself? Calvin: Because Mom won’t let me move to Madagascar. Calvin: Psst… Susie! What’s 12 + 7? Calvin: Thanks! Wait a minute. That can’t be right… That’s what she said 3 + 4 was. Susie: You’d get a good grade without doing any work. Susie: It’s wrong to get rewards you haven’t earned. Calvin: I’ve never heard of anyone who couldn’t live with that. Calvin: Where do we keep all our chainsaws, Mom? Calvin's Mom: We don’t have any chainsaws, Calvin. Calvin: We don’t? Not any? Calvin: How am I ever going to learn how to juggle? Hobbes: Jump! Jump! Jump! I win! Calvin: You win? Aaugghh! You won last time! I hate it when you win! Aarrggh! Mff! Gnnk! I hate this game! I hate the whole world! Aghhh! What a stupid game! You must have cheated! You must have used some sneaky, underhanded mindmeld to make me lose! I hate you! I didn't want to play this idiotic game in the first place! I knew you'd cheat! I knew you'd win! Oh! Oh! Aarg! Calvin: "Other kids' games are all such a bore! Calvin: They gotta have rules and they gotta keep score! Calvin: Calvinball is better by far! Calvin: It's never the same! It's always bizarre! Calvin: You don't need a team or a referee! Calvin: You know that it's great cause it's named after me!" Calvin: "I'm a simple man, Hobbes." Hobbes: "You?? Yesterday you wanted a nuclear powered car that could turn into a jet with laser-guided heat-seeking missiles!" Calvin: "I'm a simple man with complex tastes." Calvin: "My powerful brain has come up with a topic for my paper"
Calvin: "I'll write about the debate over Tyrannosaurs. Were they fearsome predators or disgusting scavengers?" Hobbes: "Which side will you defend?" Calvin: "Oh, I believe they were fearsome predators, definitely." Calvin: "They're *so* much cooler that way"
Calvin: Some people complain all the time! They complain about the least little thing! If something bugs them, they never let go of it! They just go on and on long after anyone else is interested! It's just complain, complain, complain! People who gripe all the time really drive me nuts! You'd think they'd change the subject after a while, but they never do! They just keep griping until you start to wonder, 'What's wrong with this idiot?' But they go on complaining and repeating what they've already said! Hobbes: Maybe they're not very self aware. Calvin: Boy, that's another thing that gets on my nerves! Calvin: "Well, keep your eyes open, they're bound to land here sometime." Hobbes: "What will we do when they come?" 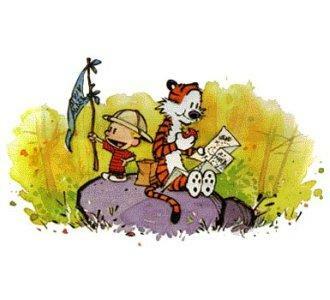 Calvin: "See if we can sell mom and dad into slavery for a star cruiser"
Hobbes: Maybe that's why it's hard to tell if we're living in a tragedy or a farce. Calvin: These real-life video programs are great! Here are ordinary people having actual, horrible experiences, which are broadcast nationwide for the public's viewing amusement! It's intrusion, exploitation, and voyeurism all in one! You never know where a video camera will be! Everything's fair game! Hobbes: Who'd have guessed Big Brother would go commercial? Calvin: I love to snicker at other people's tragedy. Calvin: Today at school, I tried to decide whether to cheat on my test or not. I wondered, is it better to do the right thing and fail...or is it better to do the wrong thing and succeed? On the one hand, undeserved success gives no satisfaction...but on the other hand, well-deserved failure gives no satisfaction either. Of course, most everybody cheats some time or other. People always bend the rules if they think they can get away with it. Then again, that doesn't justify my cheating. Then I thought, look, cheating on one little test isn't such a big deal. It doesn't hurt anyone. But then I wondered if I was just rationalizing my unwillingness to accept the consequence of not studying. Still, in the real world, people care about success, not principles. Then again, maybe that's why the world is such a mess. What a dilemma! Hobbes: So what did you decide? Calvin: Nothing. I ran out of time and I had to turn in a blank paper. Hobbes: Anymore, simply acknowledging the issue is a moral victory. Calvin: Well, it just seemed wrong to cheat on an ethics test.